Another week of 10,000 steps a day is over and here is my progress report. 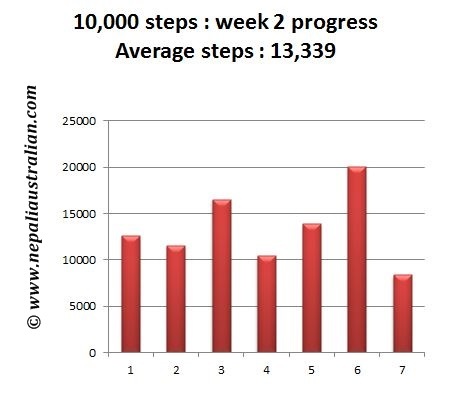 The graph is for my second week and I am surprised and happy that I clocked more than 13,339 steps on average. Happy exercising everyone, take care. This entry was posted in Health and tagged 10000 steps, exercise, health, pedometers, physical activity levels, progress report. Bookmark the permalink. Great job!! I thinking walking is really one of the best exercises and its so easy to do and costs nothing. Oh cool 🙂 We are doing a 5 k at lunch tomorrow and then zumba on Thursday. My team is Juan’s Angels. Good luck. That 5 k was more like 10 ks in the mountain. Ugh. I did Zumba today. I’m trying, but my body needs to rest. 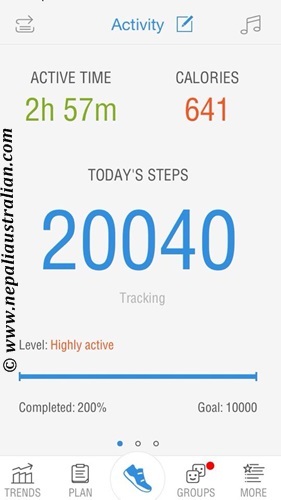 Had over 21000 steps yesterday and over 15000 today. It sure is working.